Thirty-six persons from the education sector in Region Six on February 9 received certificates after successfully completing a course in Education Management. The two year Education Management certificate course is organised by the Ministry of Education through the National Centre for Education Resource Development (NCERD) and aims to help school administrators enhance their accountability and competence in all areas of school administration and management. The program, designed for senior teachers from the nursery, primary and secondary levels is conducted via distance education, where master trainers in each region hold monthly tutorial sessions to provide guidance in the completion of assignments. In her remarks to the graduates, Director of NCERD Jennifer Cumberbatch noted that their enhancement will aid in effective supervision and support in achieving a quality education. She advised them to work with their respective Parent Teachers Associations (PTAs), communities and the staff of their schools to move education forward. She further added, quality education is a part of the nation’s agenda and access does not only evolve the attendance at school but also the provision of quality education. Cumberbatch then tasked the graduates to oversee the delivery of this vital tool. “The main pillar of quality education is the capacity of the teachers; our teachers must demonstrate competence in teaching,” she was quoted as saying by government’s Department of Public Information (DPI). Meanwhile, Region Six Chairman David Armogan said the tw0-year training program was designed to ensure head teachers can perform effectively as managers of their respective schools. The Regional Chairman said it is now expected that the schools to which the education managers are attached will record improved levels of performance. 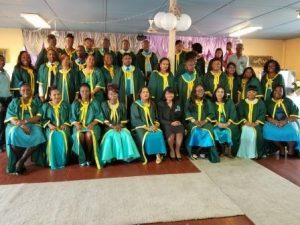 In giving the charge to the graduating class Regional Executive Officer Kim Williams-Stephen said, “We should not fail to recognise the important role educators play in the development of the country’s education system,” and asked them to lead by example. Muniram Purnwasi of Tagore Memorial Secondary who topped the region was also the nation’s top performer. Evete Mc Bean Hawker of Corentyne Comprehensive was the second best graduate, while Melany Thomas of Lesbeholden Primary was third. Punwasi said it was a privilege serve as a school administrator and be responsible for positively impacting the lives of students, giving them the reason and motivation to succeed. “We are now more competent and equipped to manage our respective schools to achieve the highest level of effectiveness,” he proclaimed. This class was the eight batch, currently, a ninth group is in training. To date, more than 400 administrators have graduated from the Education Management program in Region Six.